the tardierest explorer – nfb journey cont’d — VIRTUALLY! 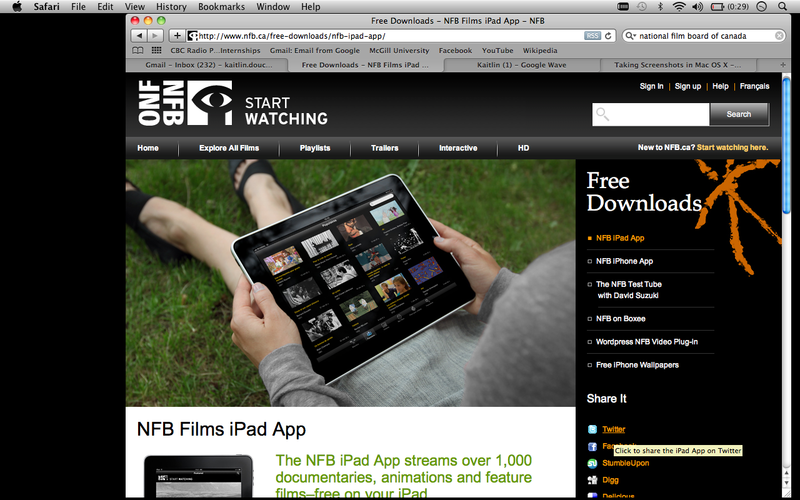 The interface of the NFB is site is deceptively simple. Every click instantly multiplies the possibilities for exploration; each unexplored corner and crevice yields valuable information about canadian cinema, our national identity, ourselves. Despite feeling a little bit overhwhelmed within the intertextual web of the NFB site, the virtual space is carefully organized and easy to navigate for first-time explorers. As a novice patriot and NFB cinephile, I enjoyed that upon clicking on a film others a side bar appeared, listing a few selections from the catalogue that I may enjoy. The NFB site was as friendly and welcoming as the workers at the actual Cinerobotheque and I have yet to be disappointed by a suggestion from either. 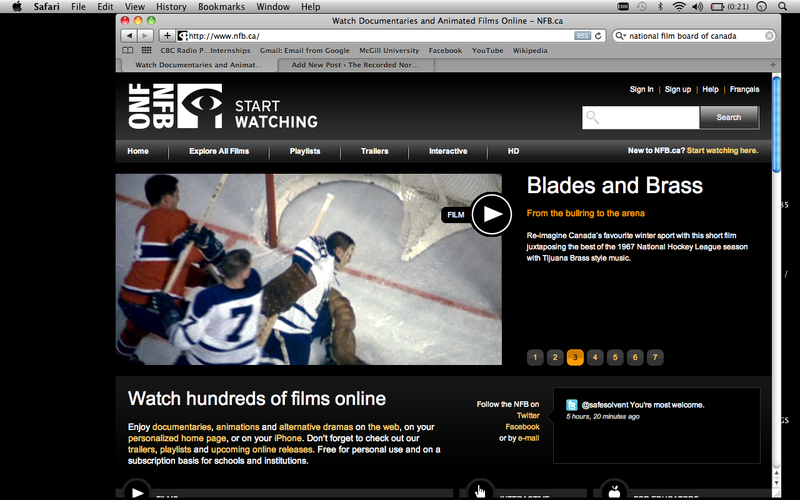 The central panel on the homepage details news and films of interest, which seemingly reflects the NFB’s foundational mandate: representing Canadians to and for Canadians through film. Scrolling through today there was talk of a hockey expose, an NFB tour, a piece on Korean-Canadians, and a film on urban gentrification. I wonder though, what is it about this conglomerate of image and ideas that emits this distinctly Canadian aura. What was that thread of Canadian commonality in these themes? For me, similarity was communicated through the less direct route of tone. The crucial self-deprecating levity of Canadians, communicated so clearly through the juxtaposition of hockey and multiculturalism relays so much about us as a people. In the space of the NFB, and for most Canadians, multiculturalism is as noble as hockey (and notably, not generally the other way around). More importantly, we we, as Canadians, would be ready to defend either with the passion that a polite sternness would allow. A lot of what distinguishes us as a people is this ability to self-reflect. Unlike our counterparts to the South, we can see the absurdity in our heated defense of ice sport and able to laugh at it. In the party of globalization, Canadians are the shy witty ones, which, to me, are always the most interesting to talk to. I do think though, that specificity of experience has to come into play. Although there is something that does interpolate a Canadian subject, they do not necessarily communicate a unilateral experience of our homeland. I wonder how my personal experience informs my reception of the site. Growing up the child of immigrants in the national capital region, aspects highlighted by the NFB, like multiculturalism, are inherent in my Canadian identity. However, others, are a little more difficult to explain. Hockey, of all things, is not something that particularly spoke to me personally, yet I still would readily associate it with this growing abstraction called Canada. What is it about this sport that resonates so strongly with us? Like myself, the NFB does not seek to give definitive answers to these questions or represent a homogenous and unified notion of Canada. The site serves as a means for Canadians to self-represent and instills the homegrown notion of democratic socialism into its conception. Twitter, an iPhone app, the now antiquated e-mail, facebook and forums are the spaces of resistance within the website; they allow Canadians to talk back to the monolith of culture that is the NFB and incorporate aspects of themselves and their home that may be over looked. However, the interactivity oft he NFB does not end there. Though the site does not yield its secrets all too readily, there are many spaces wherein the virtual explorer may drive and negotiate their own experience. For example, the most interesting to me was the component entitled “Holy Mountain”, which allowed patrons of the NFB site to explore the history of my new home, Montreal. 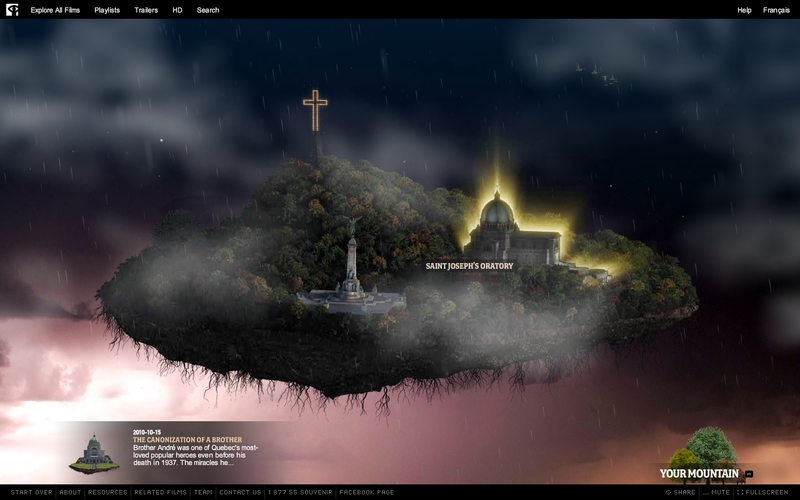 “Holy Mountain” visually represents Mont Royal as a self-contained cosmic island. The mountain, is set in rotation with the movement of the mouse over the screen, highlights spaces of historic and cultural importance which exist in the topographically gifted landmark. With every click, I was able to explore the Mountain through its detailed virtual conception (the weather on the mountain even mirrors the daily forecast in Montreal). Pluralism, is again at the fore, as the voices and impressions of the public are welcomed and met with equal esteem and encouragement as those of the canonized contributors, the filmmakers of the NFB. This is the Griersonian dream of the NFB realized: within this magical space the impossibility of utopic democratic socialism can exist. Unlike the island, Canada is grounded; our roots are embedded in the prairies of the wild west, the fisheries of the east, and the bitter cold of our white North.